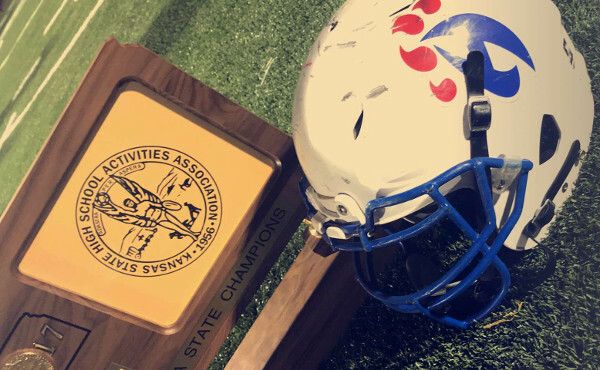 NEWTON – Hanover coach Matt Heuer took off his headset and rubbed his temples before he joined the postgame handshake line in the Eight-Man, Division II championship game Saturday. His team had a similar muted celebration after a 54-48 victory against Hodgeman County at Newton’s Fischer Field. Hanover led 48-14 midway through the third quarter before the Longhorns had a massive comeback, including 26 fourth-quarter points. Hodgeman County scored with seven seconds left on a 12-yard pass from senior quarterback Jacob Salmans to senior Trevor Morgan. The Longhorns, who had already recovered one onside kick, nearly recovered a second one. However, the kick stayed underneath the grasp of sophomore Eli Salmans and rolled out of bounds. After the customary postgame team photo on the field, Heuer momentarily stood by himself and rubbed his temples again. Hanover bumped its winning streak to 25 straight and ended the year at 13-0 for the third undefeated title in school history. The Wildcats moved to 4-3 in state games under Heuer, including a 4-0 mark in Division II titles. Hanover led 24-0 early in the second quarter and 32-8 at halftime. The Wildcats finished 6 of 7 on 2-point conversions. Hodgeman County went 3 of 7 and missed its final three conversions. “Preach to our kids all the time – two-point conversions are the biggest part of this game,” Heuer said. Hodgeman County (10-3) received a standout game from Salmans, a four-year starter. He finished 14 of 22 for 219 yards with four touchdowns against one interception. Additionally, he rushed 25 times for 151 yards and two scores. Hanover junior quarterback Daiken Stallbaumer battled through injury for a big performance. He went 13 of 17 for 232 yards and three scores. He rushed 26 times for 86 yards and a pair of touchdowns. Last year, Stallbaumer earned all-state honors at defensive back with 10 interceptions as Hanover set the eight-man single season record for INTs with 30. This year, he had just one interception entering Saturday and had played little defense due to his health. Stallbaumer battled a torn left (non-throwing) labrum injury since Week 2 and a jammed right shoulder that occurred in the semifinals. In the third quarter, he delivered a 36-yard interception return for a touchdown, and recovered a Salmans fumble with 4:19 left. Additionally, Emanuel, a Division I prospect, tweaked his knee during the contest and had to battle through. Hanover controlled the game early behind a variety of big plays, especially on third down. The Wildcats converted their first 10 third downs. Hanover led 48-14 with 5 minutes, 43 seconds left in the third quarter. Salmans quickly tossed a 43-yard scoring pass to Morgan to cut the score to 48-22 entering the fourth quarter. Hodgeman County then tallied 26 points in the final 12 minutes. With 10 minutes, 55 seconds left, Salmans again found Morgan for a 48-yard TD pass that made the score 48-30. “We relaxed a little bit, and then they caught fire, while we were cold, so obviously that doesn’t mix well,” Emanuel said. On the first offensive play after the score, Hanover responded with a 50-yard touchdown pass from Stallbaumer to senior Kevin Diederich to bump the margin back to 24 points. Hodgeman County quickly tallied with a 13-yard touchdown pass from Salmans to senior Aaron Sherrill. The Longhorns recovered the onside kick, and sophomore Eli Salmans scored from nine yards out. With 6:34 left, Hodgeman County trailed 54-42. The Longhorns recovered a fumble and had the ball at its own 36-yard line with 5 minutes, 14 seconds left. On 4th-and-1, Jacob Salmans fumbled and Stallbaumer recovered. Hodgeman County eventually regained possession with 1:40 remaining after a turnover on downs. The Longhorns needed 10 plays, including a fourth-and-1 conversion, before Salmans found Morgan for the final score. Morgan had six catches for 137 yards and three TDs. “Once the momentum swung, it was kind of hold on for dear life,” Heuer said. On the onside kick, Eli Salmans appeared to have a chance to collect the ball. Then, Stallbaumer kneed out the final play and felt similarly to Heuer.